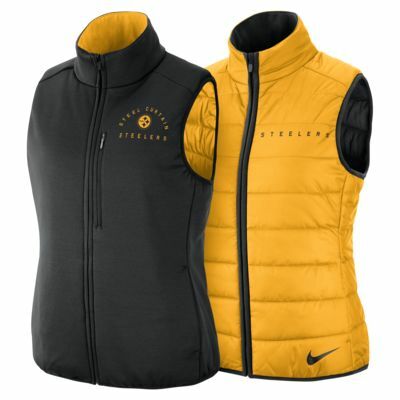 The Nike Shield (NFL Steelers) Vest has a reversible design that blocks wind and rain to help you stay warm while you cheer on your team. It features a stretch knit interior with a zippered chest pocket and smooth exterior made of ripstop. PrimaLoft® insulation offers exceptional warmth. Elastic around the sleeves and bottom provide a snug fit. Have your say. Be the first to review the Nike Shield (NFL Steelers).